In 1971, Japanese photographer Daido Moriyama took a bunch of pictures of New York City. He could’ve framed them and put them up in a gallery, but he wanted to do something different. He wanted to interact with fans rather than simply have them stare at a white wall. So, the Osaka native created PRINTING SHOW, a performance in Tokyo in 1974 that allowed gallery visitors to create their own books using printed pages of the photographs Moriyama took in New York. Moriyama also created a sample book from that event, Another Country – New York, which is now considered a collector’s item. 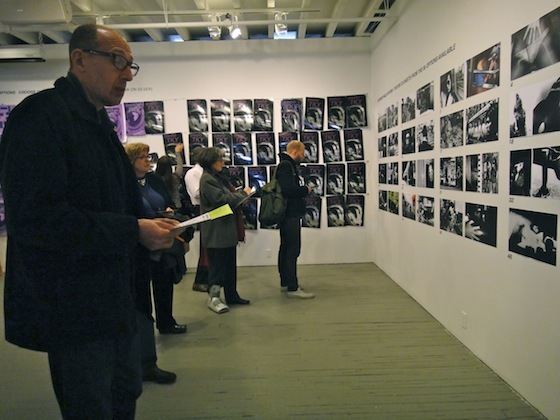 Over the weekend Moriyama recreated the performance for fans in New York with PRINTING SHOW – TKY. This time the artist brought a series of photographs taken in Tokyo over the last fifteen years in a 2-day ticketed event organized by Ivan Vartanian of Goliga, his art, photography, and design book company, and held at Aperture Foundation’s gallery in Chelsea. Visitors who purchased tickets for one of the four performances last Friday and Saturday had the rare opportunity to create their own photobook of Moriyama’s work. Although Moriyama had already published two versions of TKY, as the book is called, he discouraged visitors from choosing them. Instead, the artist wanted his visitors to be his collaborators, actively participating in deciding how their individual books will look. A book-assembly station – complete with a copy machine for making prints, an area for bookbinding, and silk screening equipment for the covers – was set up in the middle of Aperture Foundation’s wide-open space. Instead of framed photographs on the gallery walls, visitors saw a layout of 56 double-sided sheets of pictures, mostly in black and white and depicting a gritty and raw side of Tokyo’s subculture, Moriyama’s favorite subject dating back to the late ‘60s. From those sheets, visitors selected 20, deciding on the order of the pages themselves by writing the sequence on a postcard. They also had a choice between two covers, which were silk screened on site and left to dry on one wall of the gallery, making the exhibit even more organic and evolving. 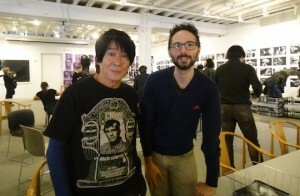 After making their selections, the visitors waited only a few minutes while their photobooks were bound by gallery workers and autographed by Moriyama himself, who casually strolled through the assembly area wearing a Jack Kerouac T-shirt and posing for pictures with admirers. The result: Dozens of books bearing the grainy, off-kilter photos of Moriyama, but with the unique stamp of each individual visitor. “I don’t know how I’m going to decide; this is almost too much,” said another gentleman who was happy he at least made the decision to use a pencil while marking his postcard. Others in the gallery selected the pages of their books using themes. For instance, one man started his book with daytime shots, moved to animals in the middle, and ended his book with nighttime shots. If you’d like to look at Moriyama’s art, the photos from PRINTING SHOW – TKY will be on display at Aperture Foundation until December 1. You can’t create your own personal TKY, but copies of the book may be available for purchase. Go to Aperture Foundation’s website to sign up for e-mail notification. Aperture Foundation, a non-profit organization that promote photography, is located at 547 W. 27th Street (between 10th and 11th Avenues), 4th Floor.